What I consider one of the best soups in the world and not just the Mediterranean is shurba al-'adas, lentil soup. This is a soup made by countless cooks in the Levant. My recipe came from my former wife Najwa and I first published it in A MEDITERRANEAN FEAST. It was there that Fran McCullough and Molly Steven discovered it to put in there book The 150 Best American recipes: Indispensable Dishes from Legendary Chefs and Undiscovered Cooks (Houghton Mifflin, 2006). 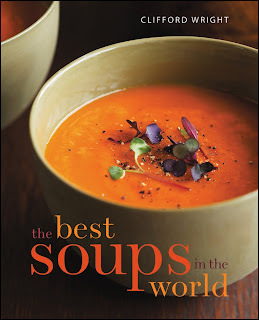 It is a soup that I simply could not leave out of my newest book due to come out in December THE BEST SOUPS IN THE WORLD. It's a popular soup in what used to be known as Greater Syria (Lebanon, Syria, Israel, Palestine, and parts of Jordan). It's based on brown lentils of course and homemade chicken broth (preferably). Try making shurba al-'adas, you'll be pleased all around.